A scathing front-page exposé in The Washington Post May 2 provides strong evidence that the largest organic milk producer in the United States has been operating illegally, jeopardizing family-scale farms here in Wisconsin. The Post’s investigative journalists visited Aurora Dairy’s largest factory farm complex in Weld County, Colorado, finding that almost all of the 15,000 cows there were confined to dirt and manure-covered pens rather than grazing out on pasture as organic law requires. These gross violations of the law were well documented in 14 formal complaints Cornucopia filed with the USDA in 2014 against CAFO operators, including Aurora’s livestock factory in Texas. Like the recent Washington Post investigation, Cornucopia’s complaints to the USDA were accompanied by detailed aerial photography. The USDA’s reaction? Cornucopia’s 2014 complaints were dismissed without any investigation. In their response, the USDA shrugged off the photographic evidence as “a single moment in time.” With the Post’s corroborating evidence, the USDA can no longer hide behind this weak excuse. Aurora Dairy is the largest supplier of “private label,” or store-brand, organic milk in the U.S. They supply such retail giants as Walmart, Costco, Target, and other major supermarket chains. Consumers buying this milk, and paying a premium price for the organic label, may be outraged by another finding of the Washington Post investigation detailed in a video on the paper’s website. They contracted with Virginia Tech to test this industrial milk for levels of the healthy fatty acids that are found in milk from dairy cows that graze on grass. They compared Aurora’s milk to other organic and conventional brands. Not surprisingly, lab testing revealed that the nutritional composition of Aurora’s milk is more like conventional milk, where cows are raised in confinement, than certified organic milk from cows regularly out on pasture. The flood of suspect organic milk coming from Aurora’s five facilities, and other huge organic CAFOs, has finally overwhelmed the organic dairy market. In the past few months, the nation’s organic milk processors have started cutting the price paid to their farmers, even placing some on quotas. The negative impact of this industrial milk goes well beyond the Goodman family’s farm. The Wisconsin-based Organic Valley Cooperative has also cut prices to farmers and implemented production quotas. Consumers and family farmers are being cheated by Aurora and other CAFOs. These corporate profiteers use their power to collude with intentionally negligent organic program regulators at the USDA. This is criminal. We need a management overhaul at the USDA to address the agency’s willingness to cast a blind eye toward lawbreakers in the organic community. Earlier this week Cornucopia sent a letter to the new secretary of agriculture, Sonny Perdue. We asked him to shakeup the USDA’s National Organic Program with new management. While we all await enforcement and other actions at the USDA, engaged consumers can do their part to help protect the best organic farmers while choosing nutritionally superior dairy products for their families. Cornucopia maintains an organic dairy scorecard of all organic dairy brands freely available on our website (www.cornucopia.org). You can vote in the marketplace with your dollars for the most nutrient-dense organic foods and support ethical family farmers. In addition to La Farge’s Organic Valley, other top-rated Wisconsin brands include: Sassy Cow (Columbus), Crystal Ball (Osceola), Castle Rock (Osseo), Cedar Grove (Plain), DCI Cheese (Sun Prairie) and the Westby Cooperative Creamery. 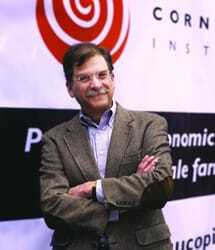 Mark A. Kastel is Cornucopia’s co-founder and senior farm policy analyst. Based in Cornucopia, Wisconsin, the donor-supported nonprofit organization is the nation’s most aggressive organic industry watchdog. Cornucopia supports economic justice for family-scale farms by defending organic integrity. Share your opinion on this topic by sending a letter to the editor to [email protected]. Include your full name, hometown and phone number. Your name and town will be published. The phone number is for verification purposes only. Please keep your letter to 250 words or less.